Zero-Max Inc offers a range of customised high torque couplings designed to handle very large power train applications. Measuring up to 20 inches in diameter with the capability to handle 78,000 Nm peak torque, the customised high torque CD couplings suit the needs of system designers seeking robust couplings for extremely large and challenging applications. According to Kevin Wells, Zero-Max Regional Sales Manager, the demand for super-sized CD couplings is growing rapidly, especially in different areas of the energy industry. 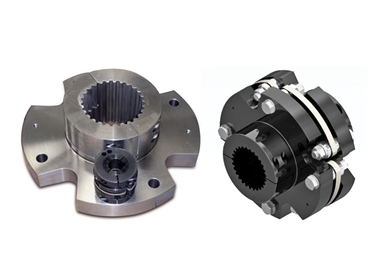 The couplings combine high torsional stiffness and high load capacity for use in applications including drive trains, gear boxes and generators providing trouble-free operation in sea water and abrasive desert sand conditions. Featuring torsional stiffness of 419,000 Nm/DEG and continuous torque of 39,000 Nm, the CD couplings have angular misalignment capacity of 1.5 degrees with axial misalignment of 6.5mm and parallel misalignment of 0.24mm. Designed around the unique composite centre disc, the super-sized CD couplings perform at these peak torques in some of the most hostile operating environments and temperatures ranging from -57ºC to +121ºC.